Rasmussen today is reporting that the Federal Reserve Board’s decision last week to raise the interest rate it charges banks for short-term loans has most Americans now expecting other rate increases this year. 76% of adults now think it’s at least somewhat likely that the Fed will raise other interest rates this year. That number includes 40% who say it is very likely. Just 14% think it is not very or not at all likely that the Fed will raise other interest rates this year. But then 54% of Americans expect interest rates to be higher a year from now. That level of belief has been unchanged since last summer. Only 37% now are at least somewhat confident that the Fed will be able to keep inflation under control and interest rates down. Just what is “The Fed” and how did it come into being? Who is the Fed? Is it an arm of our federal government? Ron Paul and over 200 members of Congress are calling for an audit of the Fed. So far? The Fed has been unresponsive. Why? I will confess to not being particularly sophisticated when it comes to high finance. I watch the Saturday morning financial shows on Fox (shoutfests, mostly), and I know enough about what’s happening in the world to make informed decisions in directing investments in my retirement account. And I strongly suspect that Obama is nothing more than the tool (literally and figuratively) for bigger global powers that are sucking the lifeblood out of America’s wealth. But why? And who are they? What’s their end game? 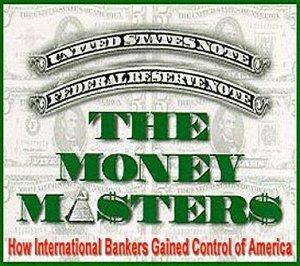 Link here to begin watching The Money Masters. You might be as captivated — and horrified — as I am.